Last week it was International Women’s Day, and to celebrate we looked at women’s roles in the Armed Forces, now and in the past. The theme of International Women’s Day this year is ‘Press for Progress’, representing a strong call for people all over the world to think, act and keep pressing forward for gender equality. Out of the whole British Armed Forces, 80% of all roles are open to women. However, all roles in the RAF and Navy are available to women, and the Army will follow suit by 2019. There are various decision-making factors which influence this, but out of interest, here’s a look at the few roles which are currently not open to women. The Infantry is at the heart of the Army, forming the core of its ground close combat capability. Infantry soldiers work on the frontline on all kinds of operations, from peacekeeping to full-scale war. 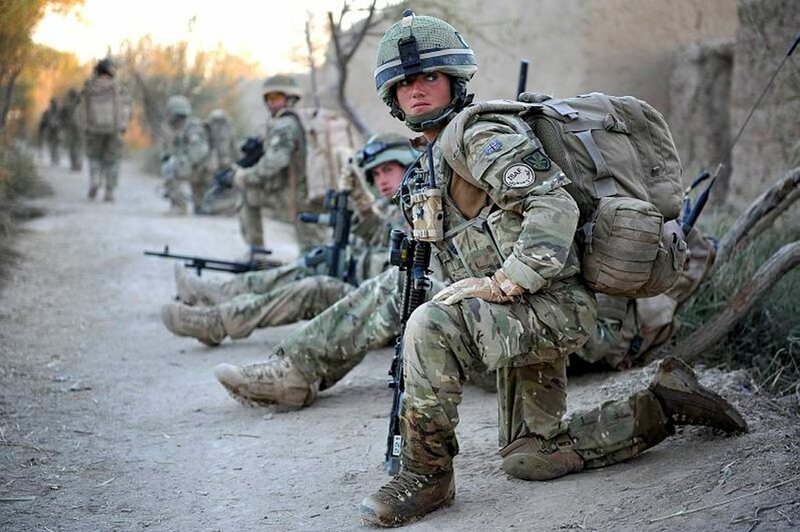 Infantry soldiers are deployed globally as part of one of Britain’s 19 infantry regiments. They’re trained in highly-skilled combat and master a number of weapons, including rifles, light machine guns and grenade launchers. As of 2019, women will be able to apply. Infantry officers command platoons of soldiers, providing leadership, guidance and support on everything from frontline operations to disaster relief missions, at home and overseas. Infantry officers can be trained in armoured, airborne, mechanised, light mechanised or light role tactics. As well as management, logistics and operations, they’re responsible for their troops’ welfare, morale and career development. As of 2019, women will be able to apply as an infantry officer. The guards are highly-trained combat soldiers who deploy on operations abroad, as well as taking part in high-profile public events. Alongside operating machine guns, mortars and missile systems on frontline operations, the guards’ ceremonial duties might include standing guard at royal residences like Buckingham Palace and Windsor Castle. Guards officers lead platoons of guardsmen on exercises and operations overseas, as well as participating in state ceremonial events. They train their troops to operate in all types of environment, deploying around the world on operations for six months at a time. Their ceremonial duties might include taking part in events like Trooping the Colour, the annual parade held on the Queen’s birthday. As of 2019 the role of Guards officer will be open to women too. Paratroopers are the Army’s airborne infantry. They’re trained to deploy behind enemy lines or on the frontline by helicopter, parachute or land. They’re the core of the Special Forces Support Group, working alongside UK Special Forces all over the world. Special Air Service reserves undertake complex military tasks on a variety of operations and exercises, often without much direct support from other units. They’re trained as military parachutists, and on using a variety of weapons systems. As reserves, they work part-time providing support to full-time regular soldiers on missions at home and overseas. It’s fair to say that women’s role within the British Armed Forces have changed significantly since they were first allowed to enrol 101 years ago. There are an increasing number of roles open to women as attitudes change and people recognise the valuable and vital role they play in the military. It is another step in the right direction in 2019 when women are able to join the infantry.